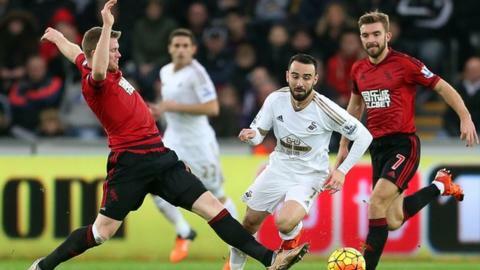 Midfielder Leon Britton says Swansea need to build on the win over West Brom when they face Crystal Palace on Monday. Ki Sung-yueng scored the only goal as Swansea won 1-0 to climb out of the Premier League relegation zone. It was the Swans' first win since they beat Aston Villa 2-1 on 24 October, and only their second in 14 league matches. "The win was coming. We just needed to keep believing, stay positive and keep doing the right things," Britton said. "Now we need to make sure we follow this up with another good performance on Monday away at Crystal Palace. "There are a lot of games in a short space of time and we want to build on this performance and look to climb back up the league." Swansea, who travel to Manchester United on 2 January, will be looking for only their second away win of the season at Palace. The win over West Brom was Swansea's first victory under Alan Curtis, who remains in caretaker charge as the club continue their search for Garry Monk's successor. Curtis spoke of his "relief" after the win and is confident further victories will follow. "For a squad of our strength that we've only won one in 13, it's not good enough," Curtis said. "It was fantastic to get that winning feeling again but relief as well because it's been so long in coming."